You've fallen head over heals in love with the characters of the new hit movie Gnomeo and Juliet, but parting doesn't have to be sweet sorrow any longer! GardenFun.com is thrilled to offer the only Officially Licensed collection of Gnomeo & Juliet Garden Stakes for your garden! Place these gnome garden stakes alongside your flower beds, or even within your indoor or outdoor potted plants and just watch the magical love story unfold! The movie was a hit, and you will be too, with our set of four Gnomeo & Juliet Garden Stakes. Each colorful Gnomeo & Juliet Garden Stake rests on a flower mound atop a four-inch metal stake to insert in your garden or indoor plant pot. 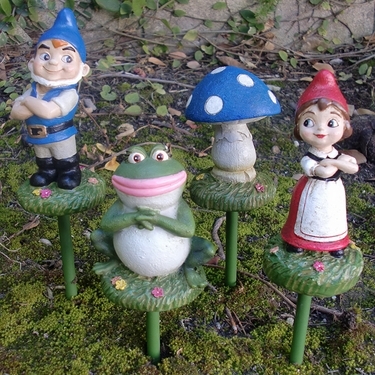 Gnomeo and Juliet are each approximately 5 inches tall, while Shroom and Nanette the Frog are each about 4 inches tall. These Gnomeo & Juliet plant stakes make great gifts! If you loved the Gnomeo and Juliet Movie, you will simply adore having these little friends frolicking between the plants of your own garden. Discreet little surprises that promise to pack a big punch! These Officially licensed Gnomeo & Juliet Garden Stakes are finally in stock! Get your holiday set before they're all gone!